We’re at the beach this week with my family and today I went to some of the local gift shops. At the beach, they can make anything they want out of shells and don’t you tell them otherwise. It’s some kind of shell creatures (frogs?) playing poker on a shell table, sitting in shell seats, wagering shell chips. Only the cans, cards, and googly eyes are not shell, and I think we all can agree they were necessary to set the scene. I almost bought this to give away as a “prize” on this blog. But, it wouldn’t really be a prize. What’s the opposite of prize? I almost bought this to give away as a punishment on this blog. Maybe whoever didn’t comment would randomly be chosen to have to own this? That’s a pretty big pool, though. And what if Dame Judi Dench won? I wouldn’t know how to get this masterpiece to her. Then I wondered, is that the best the beach could do? I’m not so sure. Maybe there’s, like, a shell dentist giving a root canal to a shell patient or a shell shell bird taking a shell crap on the head of a shell mime. I’m just brainstorming here, I’m not a shell art expert. So, I shall keep an eye out for something to top this shell poker game. Is there anything made of shells you would actually want to win? I can ask around. I really hate to admit this and will deny it later when the caffeine wears off….but I LOVE the shell poker people! Hmmm. Maybe I’ll go back and get it if enough people would be interested in being punished, I mean, winning it. OMG I want that. Crap, I commented and I am now out of the running. Maybe in my lame “mom’s summer camp” I’ll have the kids make ridiculous shell crafts. Can you do a how-to on that mime idea? That. I want them to make that and send it to their grandmothers for Christmas. Jokes on you, then it becomes an heirloom passed down through the generations. Better idea: SHELL LAST SUPPER. NICE. That has to exist, right? That poker thing would make a great Christmas gift for someone, but carefully packing it up to avoid smashing it might be an issue. I’ll send you my address. Wow, that Shell Factory sounds like a place I’d have lots of fun in for exactly 3 minutes and 54 seconds. I’ve BEEN to the Shell Factory!!! My parents have a place in FL near there and thought it would be mega super awesome to take us all there when we visited. It was NOT mega super awesome. But we did get to ride a camel. So there was that. Camel rides? Ok, that extends my estimated enjoyment time by 1 minute 37 seconds. Ack! While reading this post, all I could think about was the Shell Factory. I LOVED that place when I was, like, 8. Last year while visiting my family in Florida, my grandma asked me if I wanted to go. 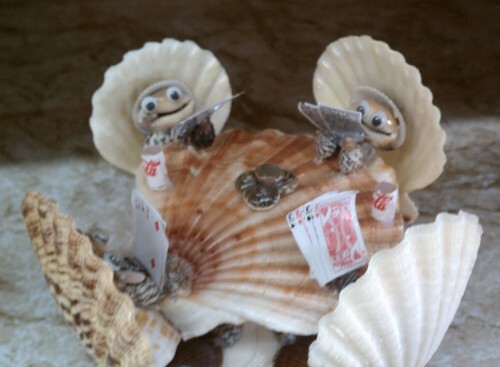 I might have said yes if I knew I could find shells playing poker. Please tell me that the shells playing cards are smoking cigarettes. If not, then we need to correct this. They are indeed smoking tiny shell cigars. Shut up! They’re smoking, too? Yeah, I want this. I have no shame. Wow, the passionate responses to this majestic piece of mass produced art is….inspiring? And I would just like to clarify that I love this thing so much, that I would put it up on a high shelf where my kids can’t destroy it. And, if they did, I would disown them. A statue of you disowning your kids made of shells would be great. Yes, I need you to procure that for me. Undercover gingers like myself are not allowed to go to the beach. Hey, speaking of mega super awesome . . . do you know what is? Shell people playing poker!! I want . . . nay I NEED that shell punishment. Please please please punish me, Carrie. I’ve been a very bad girl. Oh, um . . . sorry. It just got weird there for a minute, didn’t it. Go back there and get that thing ASAP. It must be mine. I will not rest until I own it. Or, you know, until I go back to the Shell Factory and probably pick up something very much like it. Alright, alright, I’ll go back and get it! I give the people what they want…especially if its made from seashells. I wouldn’t mind winning some shells made out of large amounts of cash if they have any of those things around. Haven’t seen any here. Maybe at Shell World? Haha I like it, it has something… I’m not sure what… Or maybe it’s too early in the day to judge! I think a lot of the commenters here are sleep deprived. Ha! Love it. I grew up on the beach so you can’t imagine the things I’ve seen. And let me tell you – you dodged a bullet – Dame Judy Dench DID win my last contest and it was a NIGHTMARE. I can just imagine, I just couldn’t be able to meet all her demands. Last time we went to the beach, Bobina and I got tattoos. The kids won’t let us go back. Oh, no shell necklaces, don’t worry. Usually I’m not a fan of shell stuff. But for some reason, that is calling to me. As someone who used to collect shells when I was a kid, I weep at the use of cowrie, cone, and sand dollar shells in these pictures. So sad. So, so sad. I’m sorry to have exposed you to such a shelltrocity. I actually think this would have been much more awesome without the non-shell props. Four shell creatures just sitting at a round table. It opens up all kinds of questions in me. Why are they there? What are they talking about? And the fact that they are sitting in shells chairs that are massive compared to their relatively small shell bodies can only mean that something diabolical is about to go down. Yes, it could be a meeting of super villains. I found this blog post in Google. Nothing will ever be better than the frog made of shells sitting the toilet reading a newspaper. I live too far away so I can’t get one, but it truly is a classic. 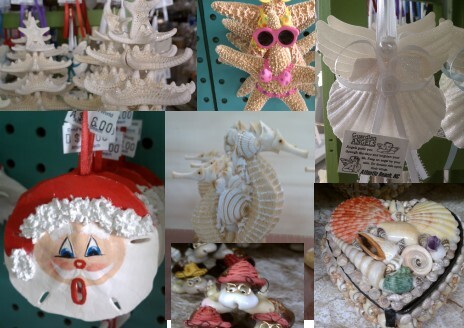 Shell Factory in Ft. Myers is a goldmine of tacky shell art.